Ambassador Morgenthau's Story. 1918. Chapter Twenty-Five. It was some time before the story of the Armenian atrocities reached the American Embassy in all its horrible details. In January and February fragmentary reports began to filter in, but the tendency was at first to regard them as mere manifestations of the disorders that had prevailed in the Armenian provinces for many years. When the reports came from Urumia, both Enver and Talaat dismissed them as wild exaggerations, and when, for the first time, we heard of the disturbances at Van, these Turkish officials declared that they were nothing more than a mob uprising which they would soon have under control. I now see what was not apparent in those early months, that the Turkish Government was determined to keep the news, as long as possible, from the outside world. It was clearly the intention that Europe and America should hear of the annihilation of the Armenian race only after that annihilation had been accomplished. As the country which the Turks particularly wished to keep in ignorance was the United States, they resorted to the most shameless prevarications when discussing the situation with myself and with my staff. In early April the authorities arrested about two hundred Armenians in Constantinople and sent them into the interior. Many of those who were then deported were educational and social leaders and men who were prominent in industry and in finance. I knew many of these men and therefore felt a personal interest in their misfortunes. But when I spoke to Talaat about their expulsion, he replied that the Government was acting in self-defense. The Armenians at Van, he said, had already shown their abilities as revolutionists; he knew that these leaders in Constantinople were corresponding with the Russians and he had every reason to fear that they would start an insurrection against the Central Government. The safest plan, therefore, was to send them to Angora and other interior towns. 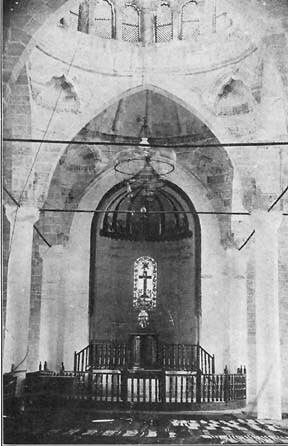 Talaat denied that this was part of any general concerted scheme to rid the city of its Armenian population, and insisted that the Armenian masses in Constantinople would not be disturbed. But soon the accounts from the interior became more specific and more disquieting. The withdrawal of the Allied fleet from the Dardanelles produced a distinct change in the atmosphere. Until then there were numerous indications that all was not going well in the Armenian provinces; when it at last became definitely established, however, that the traditional friends of Armenia, Great Britain, France, and Russia, could do nothing to help that suffering people, the mask began to disappear. In April I was suddenly deprived of the privilege of using the cipher for communicating with American consuls. The most rigorous censorship also was applied to letters. Such measures could mean only that things were happening in Asia Minor which the authorities were determined to conceal. But they did not succeed. Though all sorts of impediments were placed to travelling, certain Americans, chiefly missionaries, succeeded in getting through. Fig. 47. KAISER WILLIAM II, IN THE UNIFORM OF A TURKISH FIELD MARSHAL. He remained acquiescent, refusing to intercede, while his allies, the Turks, murdered anywhere from 600,000 to 1,000,000 Armenians. This assassination of a whole people was the worst outcome of the Prussian doctrine,---that anything is justified which promotes the success of German arms. After the massacre was over, the Kaiser decorated the Sultan, precisely as in 1898, after Abdul Hamid had just massacred 200,000 Christians, he visited that potentate and publicly embraced him. For hours they would sit in my office and, with tears streaming down their faces, they would tell me of the horrors through which they had passed. Many of these, both men and women, were almost broken in health from the scenes which they had witnessed. In many cases they brought me letters from American consuls, confirming the most dreadful of their narrations and adding many unprintable details. The general purport of all these first-hand reports was that the utter depravity and fiendishness of the Turkish nature, already sufficiently celebrated through the centuries, had now surpassed themselves. There was only one hope of saving nearly 2,000,000 people from massacre, starvation, and even worse, I was told---that was the moral power of the. United States. These spokesmen of a condemned nation declared that, unless the American Ambassador could persuade the Turk to stay his destroying arm, the whole Armenian nation would disappear. It was not only American and Canadian missionaries who made this personal appeal. Several of their German associates begged me to intercede. These men and women confirmed all the worst things which I had heard, and they were unsparing in denouncing their own fatherland. They did not conceal the humiliation which they felt, as Germans, in the fact that their own nation was allied with a people that could perpetrate such infamies, but they understood German policy well enough to know that Germany would not intercede. There was no use in expecting aid from the Kaiser, they said-America must stop the massacres, or they would go on. Technically, of course, I had no right to interfere. According to the cold-blooded legalities of the situation, the treatment of Turkish subjects by the Turkish Government was purely a domestic affair; unless it directly affected American lives and American interests, it was outside the concern of the American Government. When I first approached Talaat on the subject, he called my attention to this fact in no uncertain terms. This interview was one of the most exciting which I had had up to that time. Two missionaries had just called upon me, giving the full details of the frightful happenings at Konia. After listening to their stories, I could not restrain myself, and went immediately to the Sublime Porte. I saw at once that Talaat was in one of his most ferocious states of mind. For months he had been attempting to secure the release of one of his closest friends, Ayoub Sabri, and Zinnoun, who were held as prisoners by the English at Malta. His failure in this matter was a constant grievance and irritation; he was always talking about it, always making new suggestions for getting his friends back to Turkey, and always appealing to me for help. So furious did the Turkish Boss become when thinking about his absent friends that we usually referred to these manifestations as Talaat in his "Ayoub Sabri moods," This particular morning the Minister of the Interior was in one of his worst "Ayoub Sabri moods." Once more he had been working for the release of the exiles and once more he had failed. As usual, he attempted to preserve outer calm and courtesy to me, but his short, snappy phrases, his bull-dog rigidity, and his wrists, planted on the table, showed that it was an unfavourable moment to stir him to any sense of pity or remorse. I first spoke to him about a Canadian missionary, Dr. McNaughton, who was receiving harsh treatment in Asia Minor. "The man is an English agent," he replied, "and we have the evidence for it." "Let me see it, " I asked. "We'll do nothing for any Englishman or any Canadian," he replied, "until they release Ayoub and Zinnoun." "But you promised to treat English in the employ of Americans as Americans," I replied. "That may be," rejoined the Minister, "but a promise is not made to be kept forever. I withdraw that promise now. There is a time limit on a promise." "But if a promise is not binding, what is?" I asked. "A guarantee," Talaat answered quickly. The implications of this question were hardly diplomatic; it was merely a way of telling me that the matter was none of my business. In a moment Talaat said this in so many words. "The Armenians are not to be trusted, " he said, "besides, what we do with them does not concern the United States." I replied that I regarded myself as the friend of the Armenians and was shocked at the way that they were being treated. But he shook his head and refused to discuss the matter. I saw that nothing could be gained by forcing the issue at that time. I spoke in behalf of another British subject who was not being treated properly. "He's English, isn't he?" answered Talaat. "Then I shall do as I like with him!" "Eat him, if you wish!" I replied. "No," said Talaat, "he would go against my digestion." He was altogether in a reckless mood. "Gott strafe England!" he shouted-using one of the few German phrases that he knew. "As to your Armenians, we don't give a rap for the future! We live only in the present! As to the English, I wish you would telegraph Washington that we shall not do a thing for them until they let out Ayoub Sabri and Zinnoun!" Despite this I made another plea for Dr. McNaughton. "He's not American," said Talaat, "he's a Canadian. "It's almost the same thing, " I said. "Well," replied Talaat, "if I let him go, will you promise that the United States will annex Canada? " "I promise," said I, and we both laughed at this little joke. "Every time you come here," Talaat finally said, "you always steal something from me. All right, you can have your McNaughton!" Certainly this interview was not an encouraging beginning, so far as the Armeniens were concerned. But Talaat was not always in an "Ayoub Sabri mood." He went from one emotion to another as lightly as a child; I would find him fierce and unyielding one day, and uproariously good-natured and accommodating the next. Prudence indicated, therefore, that I should await one of his more congenial moments before approaching him on the subject that aroused all the barbarity in his nature. Such an opportunity was soon presented. One day, soon after the interview chronicled above, I called on Talaat again. The first thing he did was to open his desk and pull out a handful of yellow cablegrams. "Why don't you give this money to us? " he said, with a grin.
" What money? " I asked. "Here is a cablegram for you from America, sending you a lot of money for the Armenians. You ought not to use it that way; give it to us Turks, we need it as badly as they do." "I have not received any such cablegram," I replied. "Oh, no, but you will," he answered. "I always get all your cablegrams first, you know. After I have finished reading them I send them around to you. This statement was the literal truth. Every morning all uncoded cablegrams received in Constantinople' were forwarded to Talaat, who read them, before consenting to their being forwarded to their destinations. Even the cablegrams of the ambassadors were apparently not exempt, though, of course, the ciphered messages were not interfered with. Ordinarily I might have protested against this infringement of my rights, but Talaat's engaging frankness about pilfering my correspondence and in even waving my own cablegrams in my face gave me an excellent opening to introduce the forbidden subject. But on this occasion, as on many others, Talaat was evasive and non-committal and showed much hostility to the interest which the American people were manifesting in the Armenians. He explained his policy on the ground that the Armenians were in constant correspondence with the Russians. The definite conviction which these conversations left upon my mind was that Talaat was the most implacable enemy of this persecuted race. "He gave me the impression," such is the entry which I find in my diary on August 3d, "that Talaat is the one who desires to crush the poor Armenians." He told me that the Union and Progress Committee had carefully considered the matter in all its details and that the policy which was being pursued was that which they had officially adopted. He said that I must not get the idea that the deportations had been decided upon hastily; in reality, they were the result of prolonged and careful deliberation. To my repeated appeals that he should show mercy to these people, he sometimes responded seriously, sometimes angrily, and sometimes flippantly. "Some day," he once said, "I will come and discuss the whole Armenian subject with you," and then he added, in a low tone in Turkish: "But that day will never come!" "Why are you so interested in the Armenians, anyway?" he said, on another occasion. "You are a Jew; these people are Christians. The Mohammedans and the Jews always get on harmoniously. We are treating the Jews here all right. What have you to complain of? Why can't you let us do with these Christians as we please?" I had frequently remarked that the Turks look upon practically every question as a personal matter, yet this point of view rather stunned me. However, it was a complete revelation of Turkish mentality; the fact that, above all considerations of race and religion, there are such things as humanity and civilization, never for a moment enters their mind. They can understand a Christian fighting for a Christian and a Jew fighting for a Jew, but such abstractions as justice and decency form no part of their conception of things. "You don't seem to realize," I replied, "that I am not here as a Jew but as American Ambassador. My country contains something more than 97,000,000 Christians and something less than 3,000,000 Jews. So, at least in my ambassadorial capacity, I am 97 per cent. Christian. But after all, that is not the point. I do not appeal to you in the name of any race or any religion, but merely as a human being. You have told me many times that you want to make Turkey a part of the modern progressive world. The way you are treating the Armenians will not help you to realize that ambition; it puts you in the class of backward, reactionary peoples." "We treat the Americans all right, too," said Talaat. "I don't see why you should complain." "But Americans are outraged by your persecutions of the Armenians," I replied. "You must base your principles on humanitarianism, not racial discrimination, or the United States will not regard you as a friend and an equal. And you should understand the great changes that are taking place among Christians all over the world. They are forgetting their differences and all sects are coming together as one. You look down on American missionaries, but don't forget that it is the best element in America that supports their religious work, as well as their educational institutions. Americans are not mere materialists, always chasing money---they are broadly humanitarian, and interested in the spread of justice and civilization throughout the world. After this war is over you will face a new situation. You say that, if victorious, you can defy the world, but you are wrong. You will have to meet public opinion everywhere, especially in the United States. Our people will never forget these massacres. They will always resent the wholesale destruction of Christians in Turkey. They will look upon it as nothing but wilful murder and will seriously condemn all the men who are responsible for it. You will not be able to protect yourself under your political status and say that you acted as Minister of the Interior and not as Talaat. You are defying all ideas of justice as we understand the term in our country." Strangely enough, these remarks did not offend Talaat, but they did not shake his determination. I might as well have been talking to a stone wall. From my abstractions he immediately came down to something definite. "These people," he said, "refused to disarm when we told them to. They opposed us at Van and at Zeitoun, and they helped the Russians. There is only one way in which we can defend ourselves against them in the future, and that is just to deport them." "Suppose a few Armenians did betray you," I said. "Is that a reason for destroying a whole race? Is that an excuse for making innocent women and children suffer?" "Those things are inevitable," he replied. This remark to me was not quite so illuminating as one which Talaat made subsequently to a reporter of the Berliner Tageblatt, who asked him the same question. "We have been reproached," he said, according to this interviewer, "for making no distinction between the innocent Armenians and the guilty; but that was utterly impossible, in view of the fact that those who were innocent to-day might be guilty to-morrow"! One reason why Talaat could not discuss this matter with me freely, was because the member of the embassy staff who did the interpreting was himself an Armenian. In the early part of August, therefore, he sent a personal messenger to me, asking if I could not see him alone---he said that he himself would provide the interpreter. This was the first time that Talaat had admitted that his treatment of the Armenians was a. matter with which I had any concern. The interview took place two days afterward. It so happened that since the last time I had visited Talaat I had shaved my beard. As soon as I came in the burly Minister began talking in his customary bantering fashion. "You have become a young man again," he said; "you are so young now that I cannot go to you for advice any more." "I have shaved my beard," I replied, "because it had become very gray---made gray by your treatment of the Armenians." After this exchange of compliments we settled down to the business in hand. "I have asked you to come to-day," began Talaat, "so that I can explain our position on the whole Armenian subject. We base our objections to the Armenians on three distinct grounds. In the first place, they have enriched themselves at the expense of the Turks. In the second place, they are determined to domineer over us and to establish a separate state. In the third place, they have openly encouraged our enemies. They have assisted the Russians in the Caucasus and our failure there is largely explained by their actions. We have therefore come to the irrevocable decision that we shall make them powerless before this war is ended." On every one of these points I had plenty of arguments in rebuttal. Talaat's first objection was merely an admission that the Armenians were more industrious and more able than the dull-witted and lazy Turks. Massacre as a means of destroying business competition was certainly an original conception! 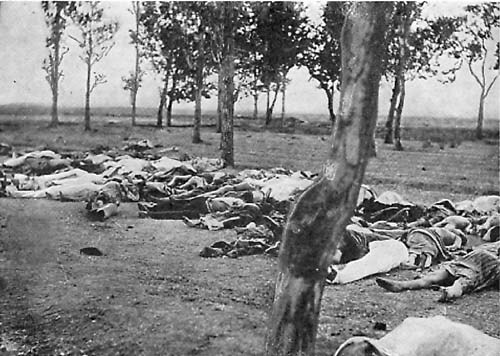 His general charge that the Armenians were "conspiring" against Turkey and that they openly sympathized with Turkey's enemies merely meant, when reduced to its original elements, that the Armenians were constantly appealing to the European Powers to protect them against robbery, murder, and outrage. The Armenian problem, like most race problems, was the result of centuries of ill-treatment and injustice. There could be only one solution for it, the creation of an orderly system of government, in which all citizens were to be treated upon an equality, and in which all offenses were to be punished as the acts of individuals and not as of peoples. I argued for a long time along these and similar lines. "It is no use for you to argue," Talaat answered, "we have already disposed of three quarters of the Armenians; there are none at all left in Bitlis, Van, and Erzeroum. The hatred between the Turks and the Armenians is now so intense that we have got to finish with them. If we don't, they will plan their revenge." "If you are not influenced by humane considerations," I replied, "think of the material loss. These people are your business men. They control many of your industries. They are very large tax-payers. What would become of you commercially without them?" "We care nothing about the commercial loss," replied Talaat. "We have figured all that out and we know that it will not exceed five million pounds. We don't worry about that. I have asked you to come here so as to let you know that our Armenian policy is absolutely fixed and that nothing can change it. We will not have the Armenians anywhere in Anatolia. They can live in the desert but nowhere else." I still attempted to persuade Talaat that the treatment of the Armenians was destroying Turkey in the eyes of the world, and that his country would never be able to recover from this infamy. "You are making a terrible mistake," I said, and I repeated the statement three times. "Yes, we may make mistakes," he replied, "but" ---and he firmly closed his lips and shook his head---"we never regret." I had many talks with Talaat on the Armenians, but I never succeeded in moving him to the slightest degree. He always came back to the points which he had made in this interview. He was very willing to grant any request I made in behalf of the Americans or even of the French and English, but I could obtain no general concessions for the Armenians. He seemed to me always to have the deepest personal feeling in this matter, and his antagonism to the Armenians seemed to increase as their sufferings increased. One day, discussing a particular Armenian, I told Talaat that he was mistaken in regarding this man as an enemy of the Turks; that in reality he was their friend. "No Armenian," replied Talaat, "can be our friend after what we have done to them." One day Talaat made what was perhaps the most astonishing request I had ever heard. The New York Life Insurance Company and the Equitable Life of New York had for years done considerable business among the Armenians. The extent to which this people insured their lives was merely another indication of their thrifty habits. "You will get no such list from me," I said, and I got up and left him. One other episode involving the Armenians stirred Talaat to one of his most ferocious moods. In the latter part of September, Mrs. Morgenthau left for America. The sufferings of the Armenians had greatly preyed upon her mind and she really left for home because she could not any longer endure to live in such a country. But she determined to make one last intercession for this poor people on her own account. Her way home took her through Bulgaria, and she had received an intimation that Queen Eleanor of that country would be glad to receive her. Perhaps it was Mrs. Morgenthau's well-known interest in social work that led to this invitation. Queen Eleanor was a high-minded woman, who had led a sad and lonely existence, and who was spending most of her time attempting to improve the condition of the poor in Bulgaria. She knew all about social work in American cities, and, a few years before, she had made all her plans to visit the United States in order to study our settlements at first hand. At the time of Mrs. Morgenthau's visit the Queen had two American nurses from the Henry Street Settlement of New York instructing a group of Bulgarian girls in the methods of the American Red Cross. My wife was mainly interested in visiting the Queen in order that, as one woman to another, she might make a plea for the Armenians. At that time the question of Bulgaria's entrance into the war had reached a critical stage, and Turkey was prepared to make concessions to gain her as an ally. It was therefore a propitious moment to make such an appeal. The Queen received Mrs. Morgenthau informally, and my wife spent about an hour telling her all about the Armenians. Most of what she said was entirely new to the Queen. Little had yet appeared in the European press on this subject, and Queen Eleanor was precisely the kind of woman from whom the truth would be concealed as long as possible. Mrs. Morgenthau gave her all the facts about the treatment of Armenian women and children and asked her to intercede in their behalf. She even went so far as to suggest that it would be a terrible thing if Bulgaria, which in the past had herself suffered such atrocities at the hands of the Turks, should now become their allies in war. Queen Eleanor was greatly moved. She thanked my wife for telling her these truths and said that she would investigate immediately and see if something could not be done. Just as Mrs. Morgenthau was getting ready to leave she saw the Duke of Mecklenburg standing near the door. The Duke was in Sofia at that time attempting to arrange for Bulgaria's participation in the war. The Queen introduced him to Mrs. Morgenthau; His Highness was polite, but his air was rather cold and injured. His whole manner, particularly the stern glances which he cast on Mrs. Morgenthau, showed that he had heard a considerable part of the conversation. As he was exerting all his efforts to bring Bulgaria in on Germany's side, it is not surprising that he did not relish the plea which Mrs. Morgenthau was making to the Queen that Bulgaria should not ally herself with Turkey. Queen Eleanor immediately interested herself in the Armenian cause, and, as a result, the Bulgarian Minister to Turkey was instructed to protest against the atrocities. This protest accomplished nothing, but it did arouse Talaat's momentary wrath against the American Ambassador. A few days afterward, when routine business called me to the Sublime Porte; I found him in an exceedingly ugly humour. He answered most of my questions savagely and in monosyllables, and I was afterward told that Mrs. Morgenthau's intercession with the Queen had put him into this mood. In a few days, however, he was as good-natured as ever, for Bulgaria had taken sides with Turkey. Talaat's attitude toward the Armenians was summed up in the proud boast which he made to his friends: "I have accomplished more toward solving the Armenian problem in three months than Abdul Hamid accomplished in thirty years!"